I am aware I’ve blogged previously about the use of iPads in my classroom, but I wanted to expand on this conversation and discuss this issue further. When I wrote this blog, I was privileged this week to present at the Victorian Dept of Education’s Innovation in Technology Showcase, so I wanted to give you a snapshot of my presentation, my vision, from 2011. I have come a long way from this blog and been working non stop since then to share my learning with my peers. 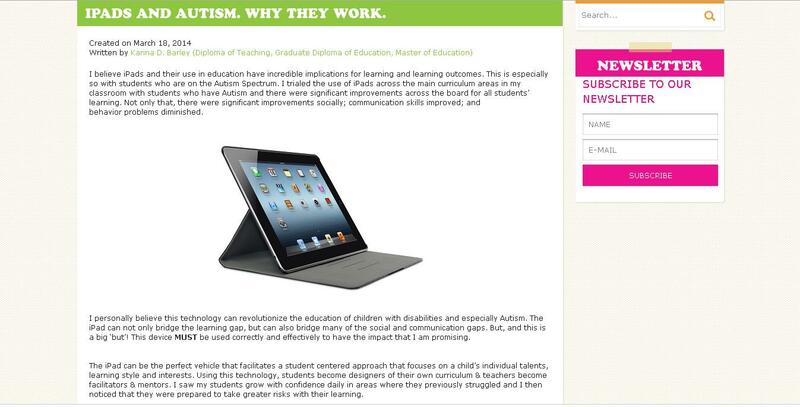 So here is my vision, my journey, for autism education. How do children with disabilities learn? What are they good at? What are their specialities? What are their gifts? If we ask these questions we come to understand that these children are not disabled at all but are different abled! From my observations in a classroom with different abled students they have many different abilities: they may have a great memory; or excellent observation skills; some are brilliant artists; others have amazing construction skills; However, one commonality emerges, the majority of these kids are very competent using technology; they connect with technology, and where they have problems in the mainstream arena, they don’t seem to have the same difficulties utilising technology. Bearing this in mind I went to the research and was surprised and also elated to find that there is significant research linking technology with significant improvements in students with disabilities and particularly autism’s learning outcomes. I wondered about a classroom that utilised technology 80% of the time. I visualised how that might look, how could the classroom physically be designed to cater for this? The problem with pcs and laptops to a degree is that they need to be hooked up to a power point all the time and some of the time with laptops (as even on a good day the most you can get out a laptop is about an hour). The other problem with the laptop was that you had to look over the screen to see what the children were doing, as well as look at their faces. 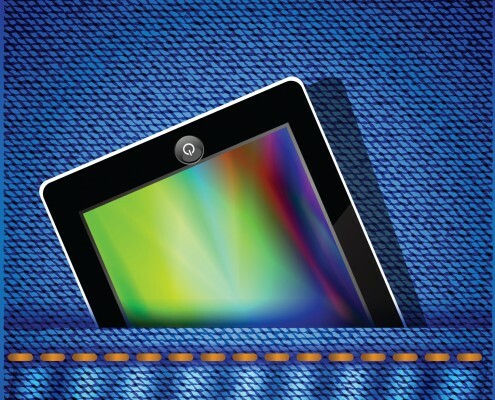 Then along came the iPad. I owned an iTouch and was convinced that if the iPad was similar, but was physically bigger, then this could have extraordinary implications and quite possibly could be the answer to my question. They were small enough to sit on the desk; with a case they could be tilted; as a teacher I could sit anywhere and observe how the student was working; the interface, with the touch screen meant almost any child could use this equipment unaided; visually the graphics are fantastic; and the device is multi-sensory in that the children can physically touch the screen, look at the graphics, listen to the sounds and in many cases use their voices. The only thing it is missing is smell and one day who knows, someday, someone may come up with the idea as to how we might get smell from the screen. I’ve been incredibly lucky as last year one parent purchased an iPad for use in the classroom for her child with autism. The results with this one student was remarkable – he sat for up to 40 mins in front of the iPad, was enthusiastic to use the technology, was motivated and asked to ‘do his words’ or ‘do counting’ on the iPad. There were other benefits as well, he starting writing independently in the classroom, starting writing at home, used more language, and showed significant improvements in behaviour. Simultaneously, I started to think about his learning and how kids with autism learn, as well as, how best can these different abled children reach their potential? I thought about asking my student about his learning? So I asked him… “Do you like reading and writing on paper or the iPad”? His answer was emphatic “the iPad”! Next question. Why? “Writing on the paper and the shapes hurts my eyes”. Hmmmm…. Note to self, if you don’t know the answer ask your student. My understanding about autism is that these children are sensorially different; their visual world looks different, sounds more heightened, and they are more sensitive to touch, colours, smells etc. So my student’s answer is one I need to heed. It is incredibly important to ask our students about their learning…..their answers will surprise you! A 9 year old boy I teach flaps his hands to the side of his eyes. Many schools try to prevent this so-called ‘abnormal’ behaviour and set about ‘training’ these kids from doing what comes naturally to them. I asked my student “why do you do that”? His answer, “because it helps my brain to think”. Why would I ever want to stop that behaviour just because it doesn’t look normal to me? Back to Ipads. The experience of using one IPad with one student gave me some impetus and I could easily envisage a classroom with an iPad for each student…again I was incredibly lucky to have a school whose leadership understood my vision, or on some level trusted it and purchased 10 iPads – technology sorted, now for the implementation. I spent the summer break researching apps and which apps might fit into the daily curriculum. I looked at the three areas of Literacy: writing, reading and speaking and listening. I found apps that I thought might work. Similarly in Bumeracy, I focused on counting, number recognition, one to one correspondence, simple operations etc. There are a lot of stand alone apps that may address counting only or number recognition. I wanted to find apps that were more adaptable, could be tailored to the individual student’s learning needs, and that incorporated more than one concept. This is an evolving process because as more apps are developed and as the year continues, I discover what our classroom needs, or what each child needs or asks for. For example I have a student interested in dinosaurs, so I found books, apps, and encyclopaedias relating to dinosaurs. Another, loves Toy Story, so I found stories and apps on Toy Story. The brilliance, is that I can set up each iPad to the individual student’s needs. My recommendation is that where possible, try to have one iPad per child. I personally don’t think group sets will work as well. The key and salient point to this entire exercise is potential! What is each child’s potential? How can I as an educator ensure all of my students are provided with the best case scenario that enables them to achieve success? For when success is achieved the desire for more success rises. Success begets success. I feel satisfied that using the iPads in my classroom as the student’s primary education tool, that I can provide them with a means by which they can achieve their full potential. There is an adage that insanity is when you continue to do the same thing over and over without results… Then why do we continue to do the same thing in education? Change the environment, introduce technology, let go of outmoded ways of thinking, step outside the box, be innovative! 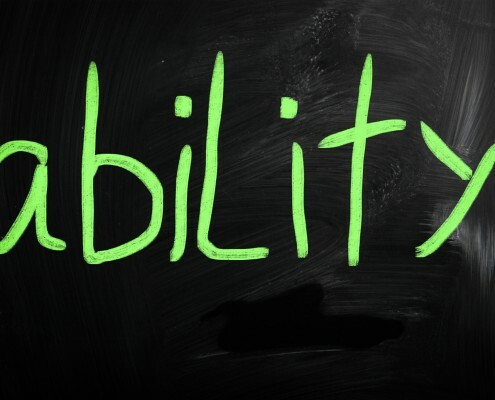 Develop your own new paradigm and in doing so the students and especially those different abled students also develop a new paradigm: they can achieve, they can have success, they can learn, they can be included in society, they can have full, productive, potentialised lives! Do we not owe them that? So back to my classroom…. I have no definitive data yet, but the classroom speaks for itself. The kids are responsible for their iPads and they are very protective of them, they know what is expected of them and they can’t wait to use their iPad, they are incredibly excited and motivated each day to work. They’ve become more student directed and I’ve become the facilitator. Each day is an adventure! I’m not saying the iPad is necessarily the panacea, however I think the attitude is; the philosophy is; the innovation is; and ultimately the new paradigm is! When we stop thinking about children with differences as disabled, we start thinking about how we can help them to learn and in doing so become the best that they can be. 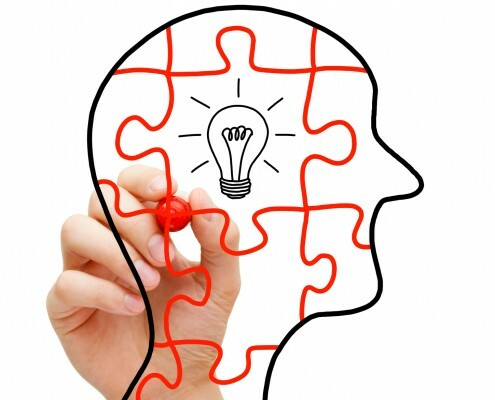 Achieve success in their learning according to their own individual learning style. Children with autism seem to naturally gravitate to technology and computers so it makes absolute sense to allow them opportunities to learn using technology. I trialed the use of iPads in my classroom for all curriculum areas for the majority of the school day. The students I taught had a history of being reluctant learners, had difficulty focusing to tasks, and would often wonder around the room avoiding the work provided. The results were remarkable and I have to say has surpassed my own expectations. The students became independent learners, including those who have some real learning issues; they couldn’t wait to use the iPads, enthusiasm and motivation was high; they thought all of the time about what app to use; how to use the app and how they want their work to look. For example, I did a very simple activity where we used an Art/Drawing app and the kids explored every aspect of that app and the pictures they produced were just brilliant… They then decided to take screenshots of their work and use the pictures for their wallpaper. 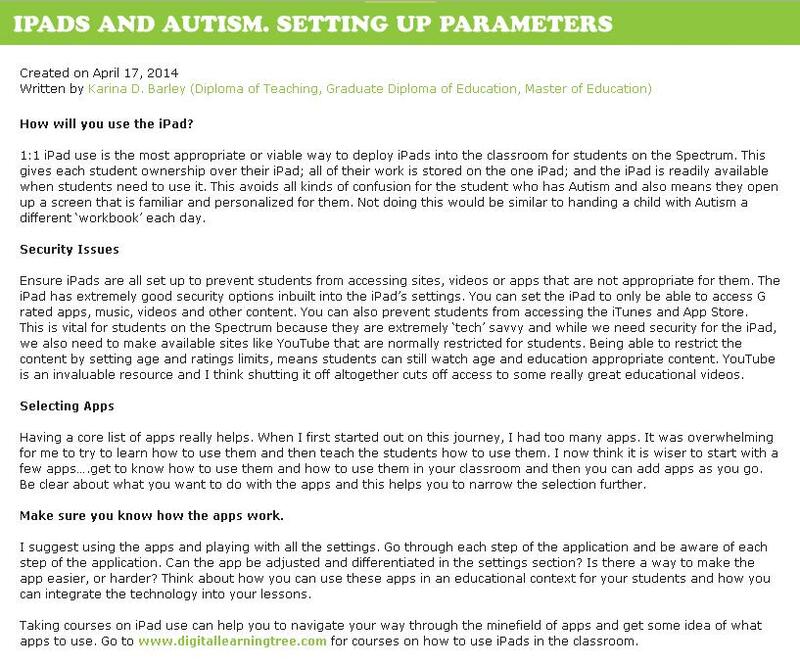 Again another article from eSchool News on iPad apps that you can use with children who have autism, quoting a veteran educator and autism consultant… ME! 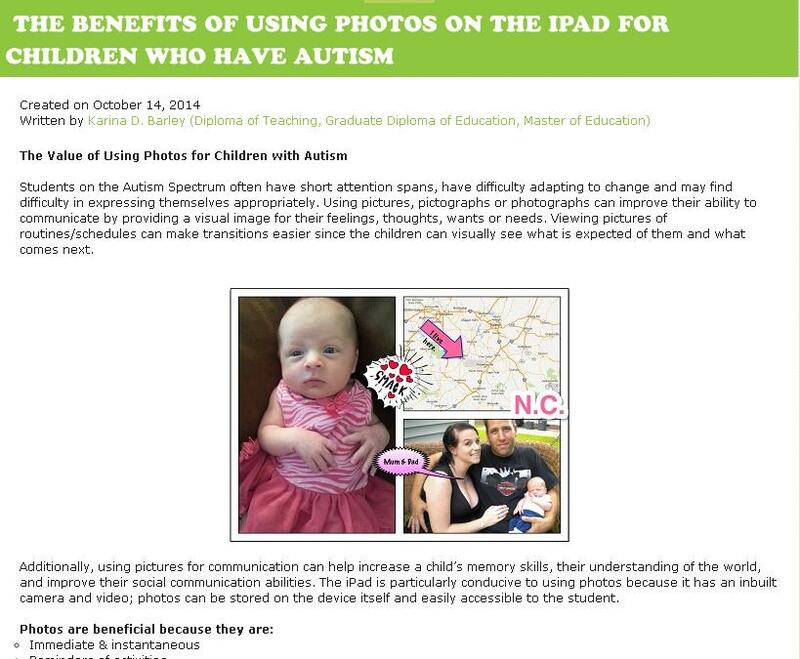 One group of apps that works well with students with autism focuses on visual aids and projects. 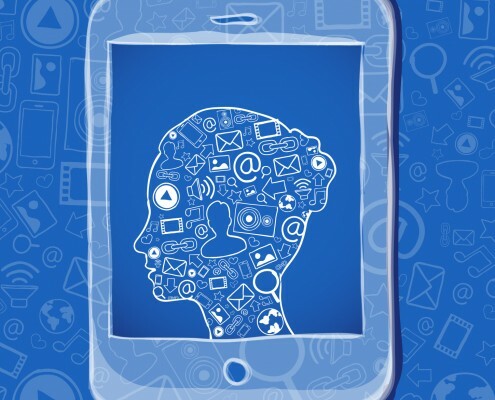 Barley suggests picking apps with photos because photos are immediate and instantaneous, reminders of activities, relevant and current, make lessons personal to the students, and are simply fun and interesting. Barley also recommends a group of apps that focuses on sensory perception. Pocket Pond: Create relaxing ripples while enjoying the sounds of nature. Interact with the fish – scare them, feed them, and watch their schooling behavior. Draw Stars: Draw Stars is game app using a lollol pen. The game scenario is that a starship travels around stars dodging the obstacles to complete a constellation. Users can experience precise movement like joystick in mobile. Gravitarium and Gravitarium2: Gravitarium combines music, art and science in one relaxing experience. $0.99; https://itunes.apple.com/us/app/gravitarium/id375602683?mt=8. Barley concluded her webinar by suggesting a group of augmentative apps. Augmentative or alternative communication is the term that “encompasses the tools and methodology used to support or replace communication for individuals that have speech or communication impairments,” she said. Students on the Autism Spectrum often have short attention spans, have difficulty adapting to change and may find difficulty in expressing themselves appropriately. Using pictures, pictographs or photographs can improve their ability to communicate by providing a visual image for their feelings, thoughts, wants or needs. Viewing pictures of routines/schedules can make transitions easier since the children can visually see what is expected of them and what comes next. To read the rest of this blog follow the link below, and sign up to the Child Development Club website to receive regular updates. We hear a lot about the term ‘Social Stories’ in the field of autism and there is a lot of discussion about how to use them for children on the Spectrum. I personally believe that social stories can be a really powerful tool that can be used for children who need visual cues and demonstrations to assist with concept development, behavior modification, and transitions and change management. 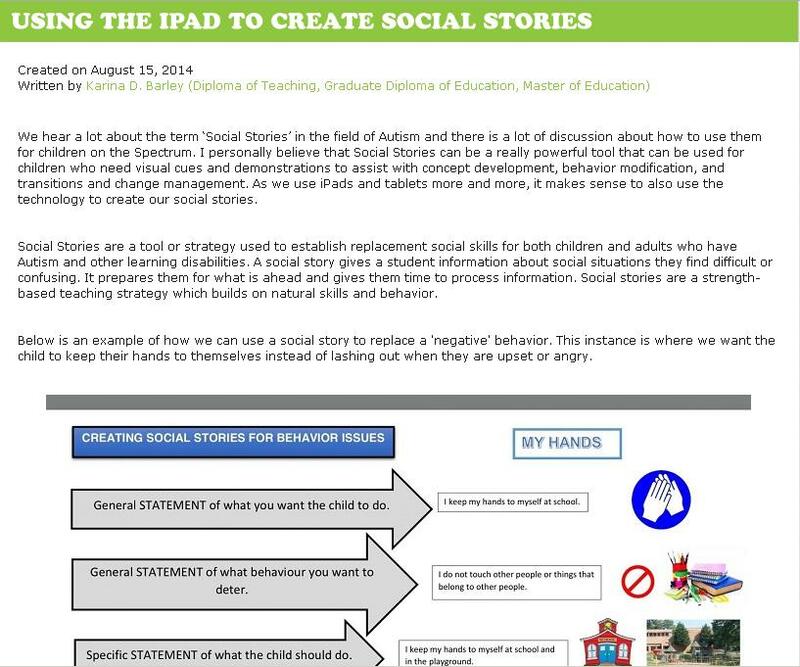 As we use iPads and tablets more and more, it makes sense to also use the technology to create our social stories. 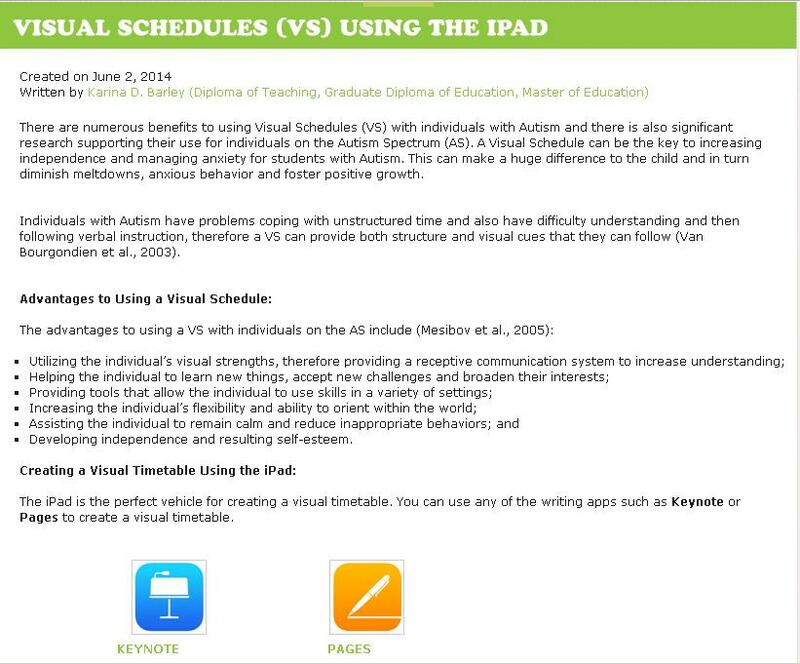 There are numerous benefits to using Visual Schedules (VS) with individuals with Autism and there is also significant research supporting their use for individuals on the Autism Spectrum (AS). A Visual Schedule can be the key to increasing independence and managing anxiety for students with Autism. This can make a huge difference to the child and in turn diminish meltdowns, anxious behavior and foster positive growth. This blog goes through the advantages of visual schedules, how to create visual schedules, and what apps you can use to create visual schedules. I recommend Keynote and Pages to create visual schedules, but there are many other options available. If you follow the links below you will be taken to the Apple App Store to download. To read the full blog follow the link, and sign up to receive regular updates. 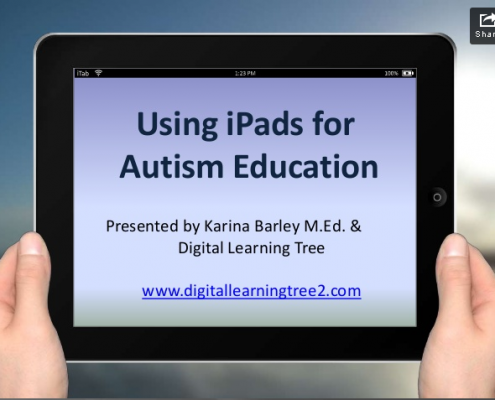 Setting up the parameters for using technology is something every parent should do, but it is especially important when you are using an iPad for autism education. How will you use the iPad? I have been writing a blog for the Child Development Club’s website for a few months now. 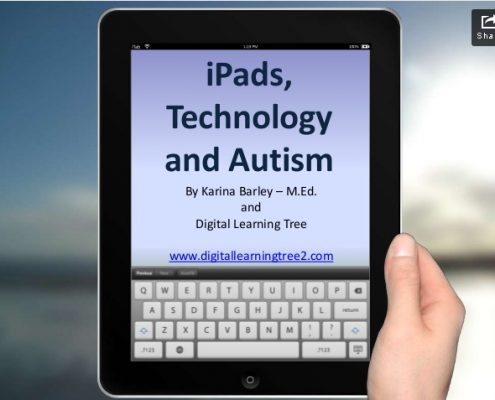 I have been sharing my insights on using iPads with children who have autism, not just in the classroom but for use at home as well. This is the first blog in the series, and I talk about iPads and why they work for children on the Autism Spectrum. If you follow the link to the Child Development Club website, you can read this full blog and sign up for their newsletter to get updates on my blog, as well as blogs from my fellow contributors. 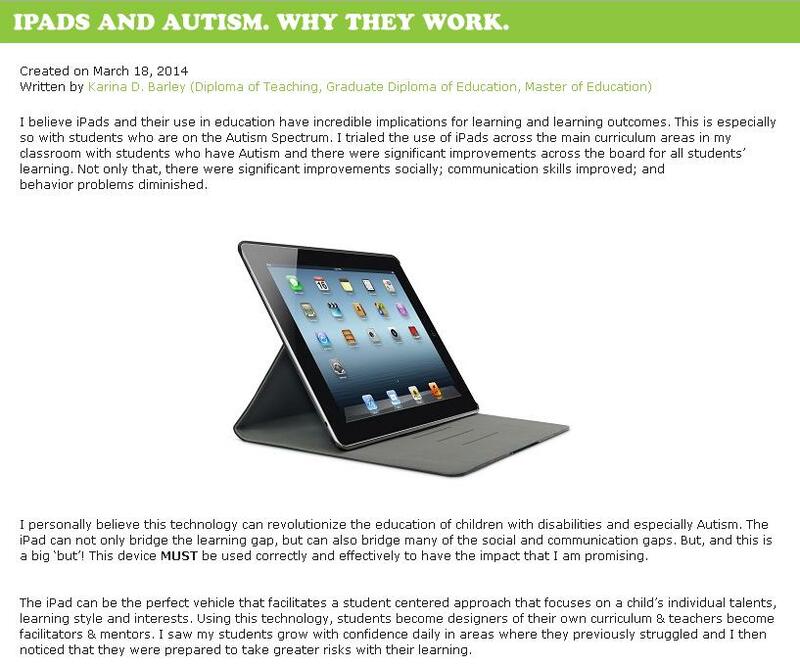 iPads and Autism. Why they work. Imagine a school, just for one moment… Where you walked into the door of the school… And the very first questionnaire would contain the questions: “What do you love to do?” What is your favorite thing in life? What are you good at? What would make you smile? How would life/school be if you could do the things that you love to do? Imagine a school whose curriculum catered for those kinds of questions… And designed a pedagogical program that is individual to your child, based on the answers to those questions? It is then that we could abandon English, Math, Science, etc. in the way that it is taught now, where we just deliver buckets of information that has no relevance to kids. Alternatively, let’s say a child’s interest is cooking; what if we were to inspire them to want to learn for example they will want to learn to read because by reading they can gain more information from recipe books. They will want to learn about measurement because this knowledge will help them to become a better chef. They will want to learn about money because they will want to go shopping to purchase their ingredients. They will want to learn about science in the context of how cooking and science interrelate. They will want to learn to write, because they will want to write their own recipes. Just recently, there’s a program called Master Junior Chef and everyone is amazed at how incredible the children are. The comments I hear are “can you believe those kids?” “Those kids are just brilliant”. “I can’t believe they can cook like that.” The recipe (pardon the pun) really isn’t that difficult to understand and while I don’t want to take away from those amazing kids (because they really are amazing), but these kids are shining because they LOVE to cook; they LOVE to do what they are doing; and when children LOVE doing something, they WILL learn!!! You don’t have to ask them, or cajole them into it, they can’t wait to get into the kitchen to cook; and to be a better cook, they will learn to read a recipe, learn the math required to get their recipes right; understand the science behind what makes recipes work, flavors taste better etc; and develop creativity in the way they present their food. As I said above, it really is NOT difficult to comprehend and in my mind, this gives me a “recipe”, a foundation, a platform from which educating children should stem from. If we start with what they LOVE to do; the rest comes naturally. I personally believe that using technology can bridge the gaps for those children who are struggling, but also make learning easier for any child. These kids come to school ‘tech’ ready and digitally aware so it makes sense that we give 21st century children the tools to learn using 21st Century technology.